In California as elsewhere, state policy anticipates that aspiring teachers will follow a uniform, multistep path into the profession. It assumes they will complete a preparation program and earn a preliminary credential, take a teaching job and be assigned probationary status, complete a two-year induction program (the Beginning Teacher Support and Assessment System, or BTSA), earn a Clear Credential, and receive tenure following two years of satisfactory evaluations. 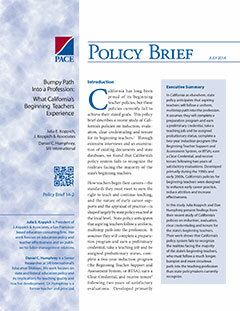 Developed primarily during the 1990s and early 2000s, California’s policies for beginning teachers were designed to enhance early career practice, reduce attrition and increase effectiveness. In this study Julia Koppich and Dan Humphrey present findings from their recent study of California’s policies on induction, evaluation, clear credentialing and tenure for the state’s beginning teachers. Their work shows that California’s policy system fails to recognize the realities facing the majority of the state’s beginning teachers, who must follow a much longer, bumpier and more circuitous path into the teaching profession than state policymakers currently recognize.